3 Comments on Kitchen Interior Design Ideas – For The New And The Old! Kitchen is believed to be the heart of a home… it is the place the meal is prepared and served (in many cases). It is also the area where a homemaker spends most of her time. That is why it is essential that this kitchen space is convenient, comfortable and efficient. By following some simple kitchen interior design ideas, you too can create a kitchen that would be easy on the eyes as well as easy/fun to work in! 1. Get an idea of the space you have at your disposal. Measure it and make a note of all the essential services such as electricity outlets, water faucets, and light switches that are already available. 2. 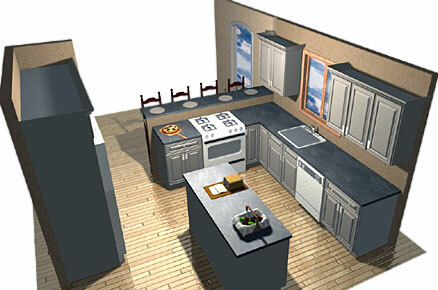 Design a basic layout for the kitchen keeping in mind the space available to you. You can opt for one of the five basic layouts – the U shape, the I shape, the L shape, G shape or the parallel layout in which two rows of countertops run parallel to each other. Another layout that has become quite popular is the island layout. In this layout, you can create an island by using a sink, a dishwasher, or a basic cabinet or a desk in the middle of the kitchen. Kitchen interior design idea – Island kitchen arrangement. Photo courtesy of Bill Stella Kitchens, Inc.
3. Figure out the basic appliances that you would need and the models available in the market. 4. Another element that is essential to your kitchen interior design is the existing service. Look out for spaces to fit the plumbing, faucets, garbage disposal unit and the dishwasher amongst others. 5. You also need to figure out the lighting, how to make the effective use of the natural light available and additional light requirements. 6. Figuring out what kind of flooring you want – timber, stone, carpet, vinyl, concrete, cork etc. is also an important aspect of the kitchen interior design. 8. The requirement of electricity and the number of outlets needed to accommodate all the appliances is also an essential consideration while finalizing the kitchen interior design. 9. Different kinds of cabinets are available in the market; you need to figure out which one would go with your kitchen interior design ideas. 10. You should also keep in mind the areas for storage… the size of cabinets, the countertops should be able to accommodate the appliances as well as leave adequate room for movement. 1. The easiest way to give a new face to the old kitchen is by changing the color of the walls. You can paint the walls again, apply a new coat, change the wallpaper or add a border… you can also add some paintings in the kitchen area to add your own signature style. 2. If you don’t want to change the whole look, you can just add couple of new appliances! Discard the old ancient cooking range and replace it with a modern chic stainless steel one. 3. You can change the color of only the cabinets. If they are dark, paint them shade lighter or vice versa. You can get new ones made or if your budget doesn’t allow that, you can just replace the door or the knobs/handles with new modern ones. 4. Another change you can make to your kitchen interior design is change the lighting… you can opt for low mood lighting in the overall areas with direct light falling over the areas that you use the most (such as the stove). 5. If you have a small space, then you can splurge on some space saving products such as dishwasher that can be used as a sink. You can also opt for hanging those pans and pots that you use frequently instead of storing them in the cabinets. 6. Add couple of accessories… put some fresh flowers in a vase, or put up pictures of your family or framed paintings. By following these basic kitchen interior design ideas, you can create a brand new kitchen area or turn an old kitchen into a new one! Meanwhile, here is a kitchen interior design software that would also help while planning your kitchen. Kitchen is one place in the house where you can do various activities like cooking, eating, chatting, and more. It is a multi-purpose area; therefore, must project favorable ambiance regardless of how it is used. If you are thinking of renovating it because of your intense desire to acquire only the best kitchen available, think twice. There is no such thing as the best kitchen in the world because every individual has a unique sense of taste. Kitchen renovation is generally a difficult task, especially for a novice like me. You might have a rough plan of what you want to accomplish with a variety of kitchen design ideas. But this may become much more complicated. So planning is crucial factor when you think of kitchen renovation. You are right, Jim. Kitchen renovation is not an easy task and proper preparation is paramount. This may even include consulting with an interior designer.